Tenino, Washington is oddly famous for two things. First, the United States Army has used a geographical map of Tenino as a standard in map reading/training since the mid-1970s (due to the variety of different symbols used on the map). Second, when the local bank closed during the Great Depression, the Tenino Chamber of Commerce temporarily issued wooden money as standard legal tender in the form of credit. 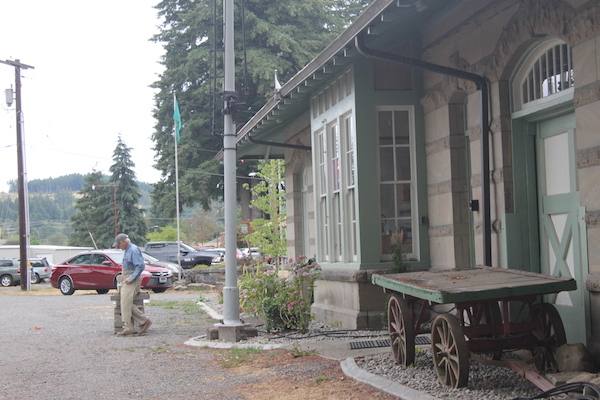 Most of the money was never redeemed, however, and the town persevered despite hard times. 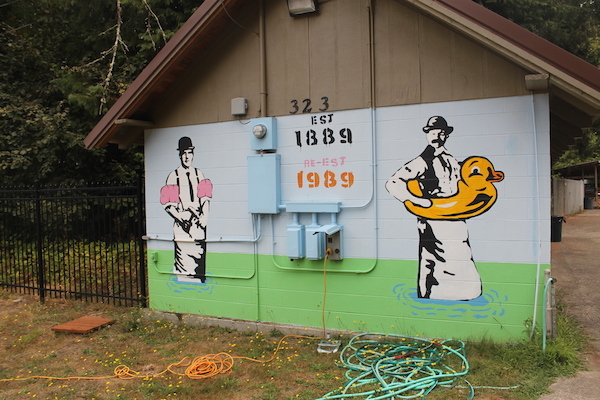 Tenino has been on my summer travel bucket list for quite some time, not because of it’s Atlas Obscura notoriety, but because of the picturesque Quarry Swimming Pool. Once a working sandstone quarry, the pit filled with water when a quarryman supposedly struck a freshwater spring with his machinery. Visiting the small town located just south of Olympia on a unseasonably cool Sunday in August, water temperatures in the quarry were a brisk fifty seven degrees (due to the depth of the pit, which ranges from three or four feet in the shallow end and slopes downward from fifteen to over one hundred feet deep in the roped-off diving areas). 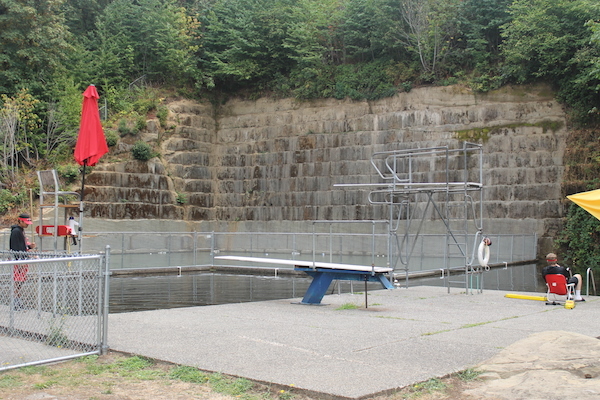 While only a handful of shivering children were making the most of their outing during our visit, the admission attendant told us the quarry pool can reach capacity in typical hot summer weather (I’m sure a plunge still feels brisk, but way more refreshing on a sweltering day.). 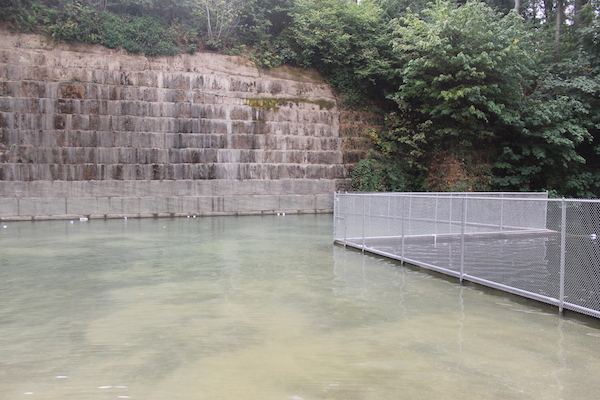 Life guards monitor two sections of the pool; a fenced “shallow” area and a roped “deep end”. Abandoned mining equipment rests at the bottom of the quarry. Don’t be concerned about diving head first into anything; when divers explored the depths of the dark waters, nothing metal was encountered even at ninety feet deep. Showers, toilets, and a changing room are available for guests to use. Daily admission ranges from $3 to $5, with season passes and punch passes available to frequent swimmers (check the pool website for hours and other important details). 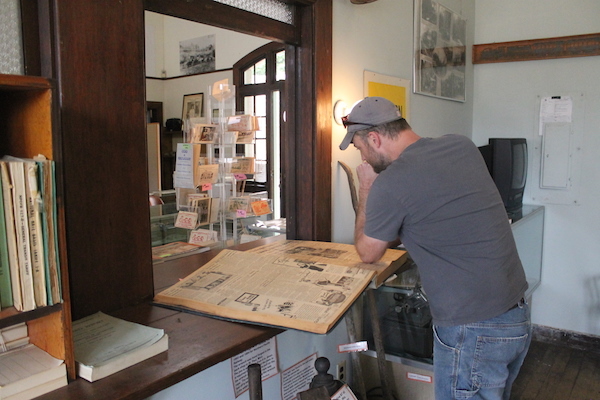 A nice counterbalance to an afternoon at the quarry pool is the opportunity to learn about the town’s history at the Train Depot Museum, now located in what was once the city’s active train depot. Exhibits range from mining to the railroad, logging, pioneer farming, baseball, military history, and the famous wooden script. Admission to the museum is free (donations accepted). Opposite the museum is a nice playground and ball fields with plenty of room for picnics and even a neat place to scramble on giant blocks of sansdtone pulled from the quarry (and overlook the swimming area – keep an eye on your kids here, though, as there’s room to slip through the cracks).